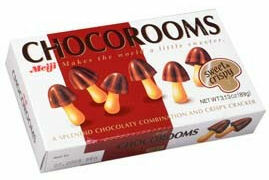 Chocorooms do not contain mushrooms of any kind. Let’s be clear about that. Not Red Belted Polypore, not Queen Boleti, not Morel. No mushrooms at all. Instead, these are “sweet and crispy” Japanese candies that happen to look like rather small mushrooms. They have cookie-like stems, with chocolate tops. Okay, so what do these fake fungi taste like? Let’s start at the bottom. The stems are not tasty in the least. They’re very bland, like a really boring biscuit. They remind me of fortune cookies a little bit, too. They also leave a slight film in your mouth. I grabbed this box without looking too closely when I saw it at my local Japanese market. 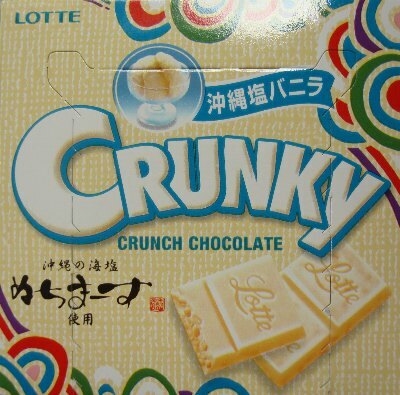 As you might gather from my last Crunky review, I was hoping to use it as part of my continuing quest to convince English-speakers to love Crunky instead of just making fun of its name. However, I wasn’t sure this plan would work, because I assumed that what I had was white chocolate. Now, I love almost everything Japanese and I love white chocolate. 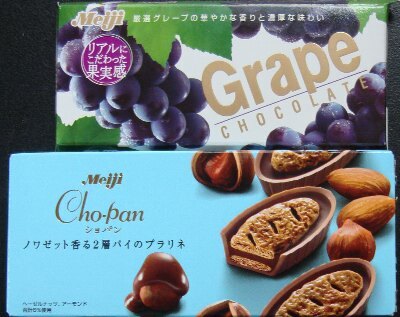 But with the exception of Crunky, I usually find Japanese chocolate to be not of the highest quality. And white chocolate, with such a mild flavor, has nothing to hide behind – if it’s not of the best quality, it’s horrid. But when I got home and looked more closely, the plot began to thicken. I wondered why the box had an illustration of a bowl of ice cream on it. The text next to the picture was something that I could only interpret as “Kanji Kanji Kanji Vanilla” (kanji being the Japanese version of Chinese characters, of which I can only read a couple dozen, none of which were included here). On the back, the pasted-on English label only deepened the mystery at first: “Okinawa Shiovanil.” And this time the problem was not one of language, exactly. I know that “shio” means “salt.” But salt-vanilla? Salt-vanilla ice cream? I love the way Japanese sweets combine the best of Western and Japanese cuisine. A Western dessert like ice cream with a Japanese flavor like green tea (or, be still my heart, black sesame) is one of the glories of world cultural interaction. And even something like a green tea Kit Kat is fun, if not the pinnacle of gourmet cuisine. 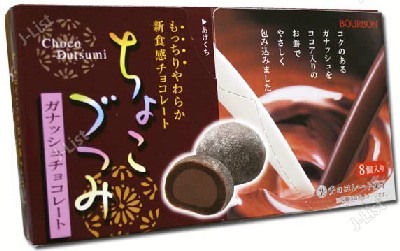 You can also do the combination the other way round – a traditional Japanese dessert made with a Western flavor – and that’s what we have here: Japanese mochi filled with Western chocolate ganache. There’s probably no more traditional Japanese sweet than mochi, which is basically a filled dumpling with a sweet rice dough. You have to love a culture that’s developed a dumpling for dessert, but the problem for me is that the filling is usually red bean. And no matter how hard I try, I have been unable to develop a fondness for red bean. The Internet is full of English speakers making fun of the name of Crunky. But hardly anyone ever mentions the fact that this is a REALLY GOOD candy bar. This is the new Crunky with even more crunch and it is even more wonderful than before. I love chocolate bars with crispy rice in them. But since I’ve become a grownup chocolate snob – er, I mean, “connoisseur” – something like a Nestle’s Crunch doesn’t satisfy me. I have been trying other brands of crisp rice bars for years. For a while I settled down with the Newman’s Own version, but somehow, the love wore off. So for a long time, I was bereft of this category of candy in my life – till I found Crunky.